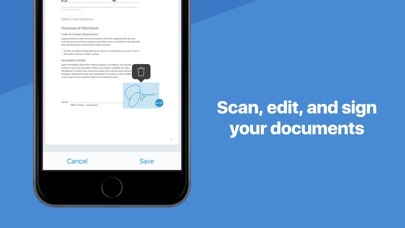 TURN ANY DOCUMENT INTO A FAX · Scan any kind of documents, receipts, contracts etc. · Create faxes from your Camera Roll, Dropbox or anywhere else · Fax documents in hundreds of countries · Forget about land line and phone lines · Enhance your documents with image correction tools · Fax directly to your address book Fax from iPhone lets you take pictures of any kind of document, whether it’s for business expenses or on-the-go legal contracts. Scan them directly in-app or use your Camera Roll. You can even turn cloud-based documents into faxes via Dropbox, Google Drive and more. GET THE BEST HD QUALITY PICTURE Fax from iPhone comes bundled with powerful image-enhancement features that let you resize, enhance and improve the quality of your faxes. It includes noise removal, shadow-reduction, and even automatic angle correction. You can make sure the recipients will be able to read them as clearly as possible. MANAGE FAXES AND REDUCE FAXING ERRORS No more worries about sending poorly scanned or messy documents. Fax from iPhone lets you combine multiple documents into one, and you get to preview everything before you send it! SEND FAXES IN A COUPLE OF TAPS You can scan and send a fax in seconds! Simply type in the number of the recipient, or use your address book contacts for an even faster process. No more struggling to find a free landline or to manually type in the right number anymore. 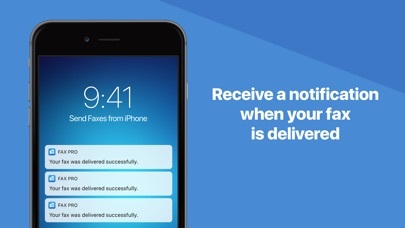 KEEP TRACK OF YOUR FAXES With Fax from iPhone, you will be notified when your documents are sent and you get a clear update when they are delivered. No more lost documents. 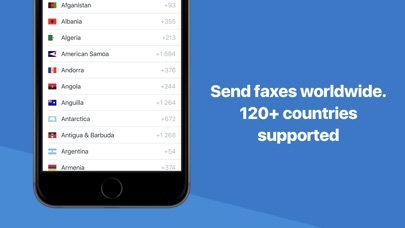 SEND FAXES WORLDWIDE You can send faxes to a record number of countries around the world - perfect for international business! SCANNER APP INTEGRATION If you already use our ScannerApp, you can integrate both apps to send your faxes easily and conveniently in seconds. 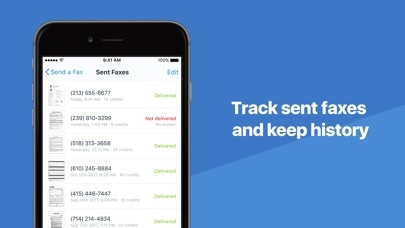 So if you need to send faxes regularly, forget about the trouble of locating fax machines and painstakingly scanning your documents. 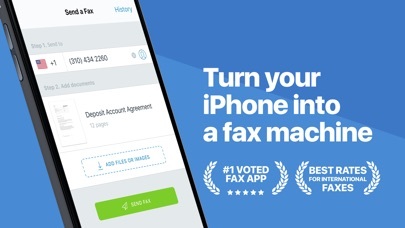 Do it in on the go and in a couple of taps right from your phone or tablet with Fax from iPhone. Maybe I’m just unfamiliar with how much faxes cost since I rarely send them, but my 14 page document cost me $8 to send. Pricing is in the range of $.50-.66 per page to send. But you cannot just pay for the pages you are sending, you have to buy credits in preset increments, which means you’ll almost surely have to buy more than you need and let the rest sit unused in your account. For example. My 14 pages required 140 credits to send. I could buy 200 credits for $9.99 or 75 credits for $3.99. 200 would be way too much so I bought two 75-packs. The price per credit would be higher but would leave me with less unused. This cost $8. I have 10 credits in my account which I may never need for a good long while. If you could buy just what you need, and if the cost were less, I would give this app 5 stars. I had to send some pages, it was late most places are closed but I really needed to send some important documents over, I didn't mind paying for sending at a decent price, after trying many apps that were either not working or very difficult to use, this app fit the bill and it got my pages accross to where they needed to go. A very big thanks for making it so easy. Now I can fax from anywhere at anytime. I knew I’d have to pay, I expected it. I have one page to send and it HAS to be faxed or mailed. I figured it’d be competitive with the cost of a stamp to get this guy out the door. 15 credits for 99 cents? That’s incredible, if a credit is one page. Turns out this isn’t the case; to send one single solitary page is 10 credits! I’d pay if it were competitive with the cost of a stamp, but it’s not, so I’m thinking I’ll just stick with a stamp or find another app that is more straightforward with their pricing scheme. Downloaded app, uploaded the 4 pages I needed to fax, bought the required amt of credits. 5 minutes later, done. Yay!